What was the easiest harvester combine to work on ? Posted: Wed Dec 13, 2017 5:23 am Post subject: Re: What was the easiest harvester combine to work on ? Working on those 100 and 20 series Deere combines could make anyone lose their religion! Posted: Wed Dec 13, 2017 5:58 am Post subject: Re: What was the easiest harvester combine to work on ? No, it is a different one. But that is beauty! Posted: Wed Dec 13, 2017 6:10 am Post subject: Re: What was the easiest harvester combine to work on ? Are you selling this one? Posted: Wed Dec 13, 2017 6:28 am Post subject: Re: What was the easiest harvester combine to work on ? Posted: Wed Dec 13, 2017 9:05 am Post subject: Re: What was the easiest harvester combine to work on ? 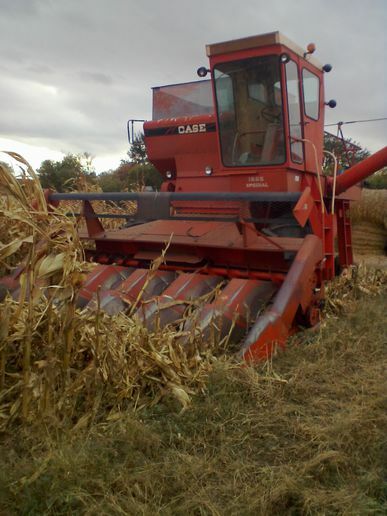 The J I Case combines, Then the M and L series Gleaners. Once any color machine gets over 4000 hours on they all need attention and constant repairs. Sealed bearings only last the life of the bearing. Posted: Wed Dec 13, 2017 3:17 pm Post subject: Re: What was the easiest harvester combine to work on ? Well all Ive worked on is Gleaners and All-Crops so I cant say much. I will say the SP100 is a bear to work on. Posted: Wed Dec 13, 2017 4:18 pm Post subject: Re: What was the easiest harvester combine to work on ? The IHC 715 with the 844 corn head was good to work on. with the 744 head they sucked. Posted: Wed Dec 13, 2017 7:04 pm Post subject: Re: What was the easiest harvester combine to work on ? turned out the tin was better than the sheet metal on ours. So suddenly we had a month to get a foreign machine ready for the field. attached and lifting it with the loader tractor to get it lined up just right. There was a lot of cussing that day. Posted: Wed Dec 13, 2017 7:34 pm Post subject: Re: What was the easiest harvester combine to work on ? I definitely disagree. They are miserable SOBS to work on. Did you ever do anything related to the engine? Just checking the oil was a chore. It took me and my old man all morning one day to replace the separator drive belt on my 90. I did the same thing on my JD 55 by myself in half a hour. Posted: Thu Dec 14, 2017 3:06 am Post subject: Re: What was the easiest harvester combine to work on ? I guess the easiest is the brand you?re partial to. Posted: Thu Dec 14, 2017 7:35 pm Post subject: Re: What was the easiest harvester combine to work on ? I will tell you that engine under there was a chore. I hear horror stories now about fires, but I can't recall ever having buildup on ours. It must have been that dummy fan that was at the engine (where there was no radiator!) that kept her blown off. It was just a four blade as I recall. I recall one time we had a suspect battery in our super 92. I can't remember what the deal was exactly (or why we didn't just replace it if we thought it was headed south), but it shorted out in the middle of harvest one day. There wasn't even enough warning before the engine died to raise the header. With their design that meant we couldn't get the battery out. I recall removing the cables and hooking up two sets of jumper cables to the new battery to get it started and raise the table to get the old battery out of the tray and put the new one in. Other than that, we never really had any engine issues. That Chrysler was a good engine although it seemed to flood really easy. We had two of those combines and with both of them you had to shut off the gas before you turned off the key and turn it on just right before you fired it up. This was back when the machines weren't very old. Come to think of it, it was also handy to need to add gas to them in the midddle of the day. I was tasked with filling old metal oil cans on the tailgate of the pickup and then backing up to the combine because you needed that additional three feet of height to get them hoisted up onto that back platform. I wonder where all of these fond memories come from? I haven't even talked about the busted final drives and replacing those in the field. Posted: Thu Dec 14, 2017 7:57 pm Post subject: Re: What was the easiest harvester combine to work on ? Years ago I had an F2, was looking at a JD 6600. Exactly twice as many belts on the JD, and usually a shaft had 2 or 3 of them on. So replacing any bearing was more involved in what had to be taken off to get to it. Yeah, JD and IH look nice going down the field, with everything covered up, but I"ll take a Gleaner any day with everything easily accessible, instead of all the fancy sheet metal covering it up. Posted: Thu Dec 14, 2017 9:27 pm Post subject: Re: What was the easiest harvester combine to work on ? Posted: Fri Dec 15, 2017 7:20 am Post subject: Re: What was the easiest harvester combine to work on ? amount of work as well. Posted: Fri Dec 15, 2017 2:55 pm Post subject: Re: What was the easiest harvester combine to work on ? this has been very educational! I'm a fairly new rookie combine owner and started with my 3300! And having earned two college degrees ive obtained more "learning" turning a wrench on this old beast lol! Thanks to everyone who has responded to this posting .